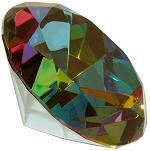 Sparkling, huge brilliant cut Diamond Crystal paperweights in jewel colors make dazzling wedding favors! These exquisite diamond paperweights are a perfect Feng Shui tool to place in your wealth bowl. Optically pure crystal with no swirls or bubbles.